It’s time to let improv comedy change your life. 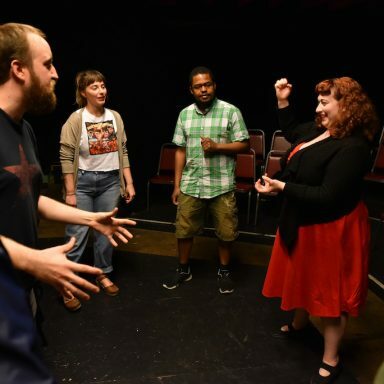 Improv is not only an incredible tool for comedians and actors making strides toward a creative future, but also for anyone looking for a way to meet new people while participating in a fun and supportive group activity. The skills covered in this Level 1 course are an introduction to the basics of how to perform “”Long-form improv”” comedy, a unique art-form that uses group collaboration to create spontaneous theatrical pieces. As a bonus, the skills covered in this course (including listening, reacting honestly, and being supportive) have benefits which help people in their behavior both on and off-stage (in both personal and professional lives). So, consider taking the plunge and join us for improv Level 1. The course will be held at the theater located at 616 Lavaca Street in downtown Austin and will contain 8 weekly classes from 6:30pm-8:30pm starting Tuesday, May 28th, followed by a Sunday night recital show for your friends and family in July. Students who complete Improv Level 1 will be eligible to enroll in Improv Level 2. To celebrate the grand re-opening of Fallout Theater (well OK so we never actually closed), tuition is a flat $150, ($75 off the original rate of $225). This class is limited to 12 students, so reserve your spot now! This rate is ludicrously low, and this class will fill up fast!! Have questions about the class? Feel free to shoot us an e-mail at contact@fallouttheater.com. Information about the teacher for this course will be added after the teacher has been scheduled.